Spend a perfect day with your friends, family or partner in our natural location; riding horses, stroking the animals or simply soaking up the peaceful surroundings. We are situated in stunning Kayuputih village just a ten minute drive into the hills from Lovina. 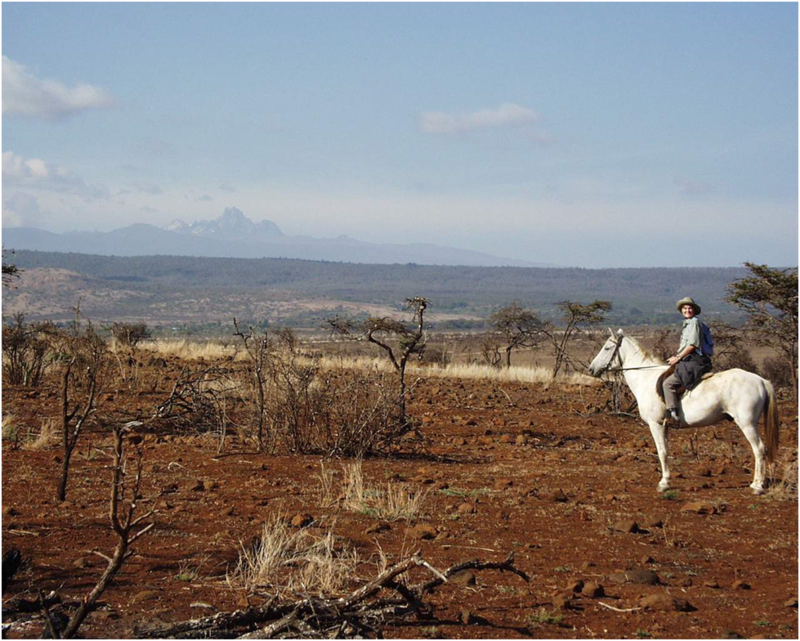 We have horses and treks suitable for everyone – from exciting 2 hour jungle treks for adventurous riders to pony rides for children. No matter what your age or riding experience we guarantee you will have a great time. 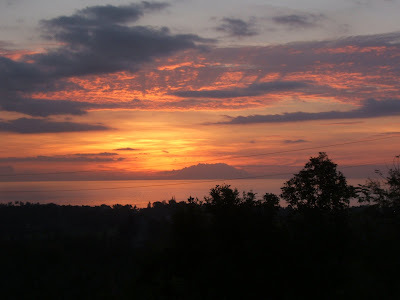 Overlooking the North Bali bay and east Java volcanoes, see sunsets, sunrises and beautiful views. 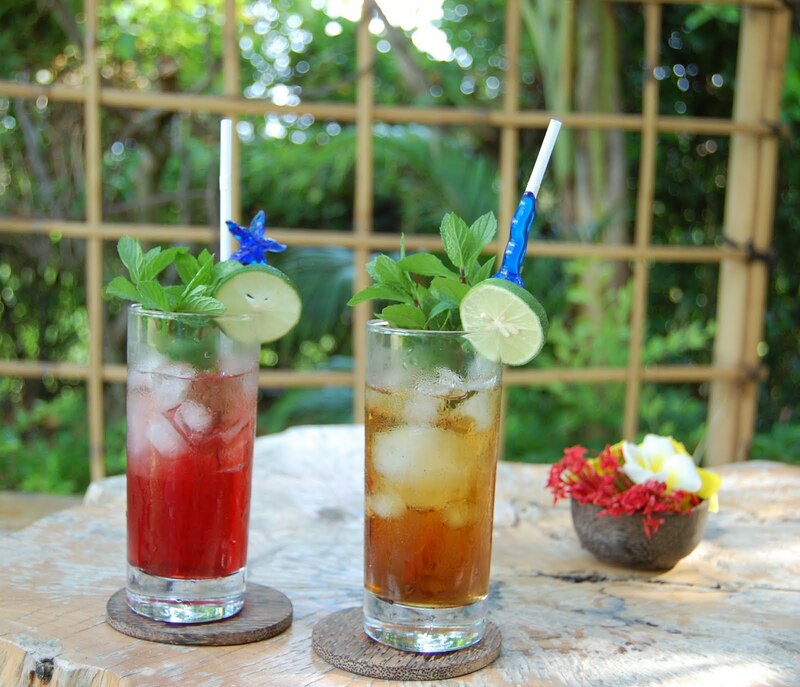 After your ride taste our delicious light refreshments or have a wander around our organic gardens or mango groves. 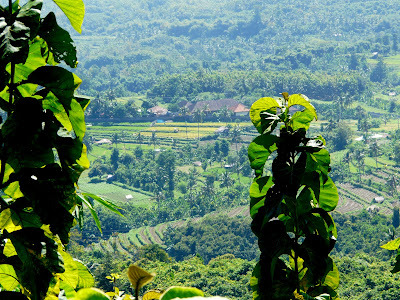 Experience real Balinese life in the hills above Lovina. "Wonderful experience the staff is very attentive I truly enjoyed the delicious meal plus eating under the stars… thank you for this special moment"
"Well done Tanya and Gede for creating a lovely spot in paradise, I love what you are doing with the organic gardens and organic food café. You are an inspiration. All the best for your future." "What an absolutely amazing 2 hour trek… the scenery was incredible. You’ve created a most beautiful haven and we wish you all the best for evolving even further. Marcus and Putra are just awesome- our love and blessings to you all. We will be back…." Jules and mike New Zealand. "Lovely staff, beautiful atmosphere. The horses are so happy and well looked after. What you guys are doing with the disabled people and organic farming is so noble & appreciated. I hope more people will have the pleasure of visiting this wonderful place." "Very exhilarating and a most enjoyable ride. Thanks a lot Gede who taught me so many things about riding! Will use these skills in aus! Thanks"
"It was really fun and I enjoyed it a lot. It was really good for a first time ride thanks you a lot!" 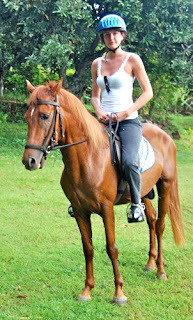 "It was very funny to ride with you Gede and your horses thank you a lot! As isch e glutei sach, wo hr dam ached und wunsched eu viel Gluck und Erfols fir’d zuehunft!" "Such a lovely place. Great hospitality with Tanya and Gede. Thank you for a traditional Balinese breakfast amongst your gorgeous gardens – a memory our children and us won’t forget." "Thank you for a beautiful ride. We all loved our horses Marcus Putra Snowcone and Gembira. We loved your company Tanya Gede and Kadek. And we love your project; the organic gardening, riding for disabled people. We wish you success and much happiness." "It was such a lovely ride. All of the staff were so friendly , and the locals are too kind. I look forward to coming back at Christmas." Everything served on the farm is fresh and homemade. We don’t use any additives, sachets or preservatives. We prepare everything including our drinks with honey, no processed sugar. After your ride you can order freshly sliced tropical fruit or if you are feeling hungry try our mango and almond muffins or luscious lime cake. All of our baking is dairy free. We replace white sugar with natural local palm sugar and use coconut milk and soy based butter as alternatives. Our half hour ride around the farm is suitable for everyone. It is especially recommend for first time riders or for children. Our village and plantation trek is for everyone. Especially at sunset you can see beautiful views of the sun setting over the volcanoes of east Java. An enjoyable ride with spectacular views of the Lovina bay, rice paddies and village red rooftops. Requires a little experience, but is altogether a relaxing ride. The perfect family ride.Aprox 75 min. 4. 2 hours..........650.000IDR If you can already ride, take an exciting 2 hour trek through jungle paths along steep drops and enjoy amazing views. 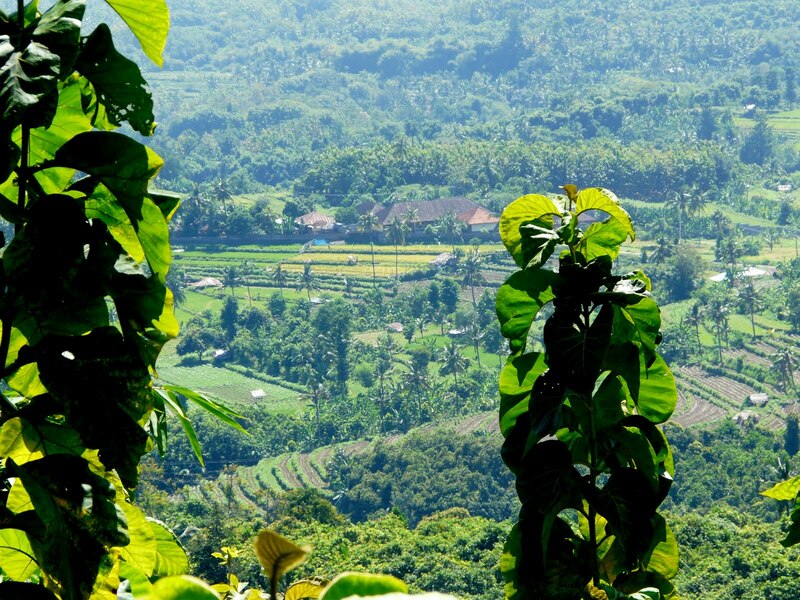 See the real Balinese village life - don't forget to bring your camera! Rides 2, 3 and 4 include free refreshments. Anyone who is not able to ride alone will be led by one of our friendly guides. - 1 hour lesson - Start weekly riding lessons, suitable for all levels of experience. You can start at any level - call us for more info. - Free therapeutic riding for disabled. Donations welcome. 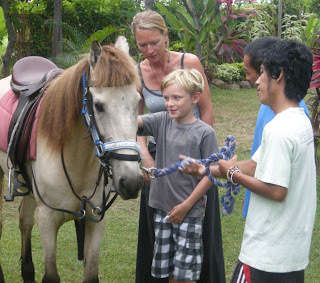 - Therapy Horse session - call us for more info. Transport from the Lovina area available by prior arrangement on request. Gede was born and raised in Bali. From a young age he was taught how to ride and care for horses by both English and Australian teachers. At 13 he went to high school in Nelson, New Zealand. He continued to live there for five years carrying out his high school education. Whilst in New Zealand he did voluntary work helping the RDA (riding for disabled association). 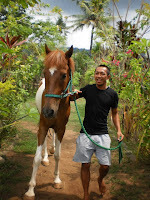 When returning back to Bali, he decided to care for his stepfather’s horses and organically farm his land. A year later Gede set up Pegasus Farm. Koming is also a local villager from Kayuputih. He is young, but he is learning the ropes really quickly. He is great with all the horses. He is a delightful young man who brings a smile to everyone who visits the farm. Wari is also from here in Kayuputih. She fits in really well here at the Farm. The fresh organic drinks are delicious. For 3 years she worked in the south of Bali in a restaurant before returning to her home to have her first child. She is a lovely lady and for both staff and guests she is a pleasure to be around. Valerie is originally from England. She is passionate about horses and has been around them most of her life. As a child she lived in the country side and would spend her holiday time helping out at neighbors horse stables , exercising and grooming the horses. She has been living in Bali for 4 years. One day she went riding with her family at Pegasus Farm and loved the area and horses so much she became a voluntary team member. She now keeps her own horse at the Farm. We offer rides for all abilities, for beginners, for children, and harder rides as well as rides for the disabled. So no matter what your age or riding experience you will feel comfortable riding our horses. Take a joyful ride around our farm, through our mango groves, rice paddies and soak up the atmosphere. For the more adventurous there are treks in the hills. Enjoy the spectacular scenery riding through the local villages, and meet the local people, watch beautiful sunsets and simply have a wonderful day. 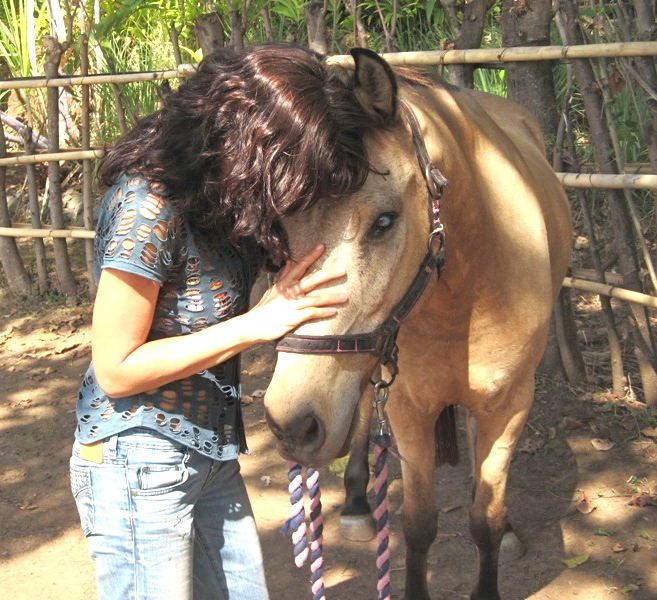 We also offer horse therapy to aid you in your healing to whatever level you want to go. 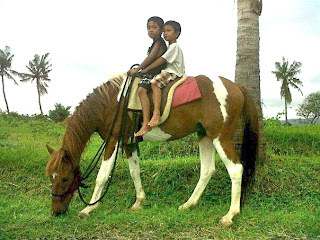 We have four horses, Putra, Marcus, Gembira and Pinto. They are all experienced horses. Putra is a very kind and calm horse, he listens to you, he loves to help, he understands people and is very sensitive. We use him especially for nervous and disabled riders. He is also used as a therapy horse as seen in this photo. He is a joy to ride. Marcus is a fit and intelligent horse. He looks after beginners very well. If you are an experienced rider, he can challenge you, maybe to your limits of exhilaration. Gembira is a wonderfully intelligent horse and a very comfortable ride. Pinto is extremely smart and gentle. He loves children just as much as they love him. After riding him you can feed him some fruit or banana leaf and he will be your best friend for ever! He loves to eat. He is a great ride for complete beginner to experienced rider. Also close to the farm there are two fine resorts and private villas 5-10 minutes away from the farm (Puri Manga, Damai). Transport service available on request. Pegasus Farm has been organic for eight years. If you would like to purchase some of our produce you can either come up and choose what you would like from the garden or we can deliver to you. Either way, everything you purchase we guarantee will be freshly picked right after you order. 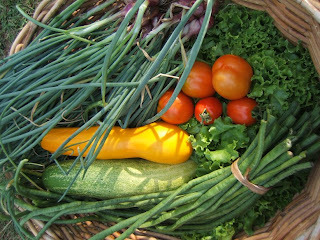 S age, basil, garlic, onion, zucchini flower, zucchini, aubergine, rosemary, coriander, water grass, sayur hijau, long bean, spinach, 3 varieties of lettuce, balinese chili, short green bean, long red/green chili, bok choy, celery, cucumber, rocket, sweet corn, cherry tomatoes, tomatoes. We do free deliveries in the Lovina area on Mondays and Thursdays. All our green leafy vegetables and lettuces are packed in high quality resealable bags to keep freshness for longer. We only use handmade newspaper bags to deliver the fresh produce to you. If you would like weekly updates on what produce is available please email us. Help to keep Bali plastic free! 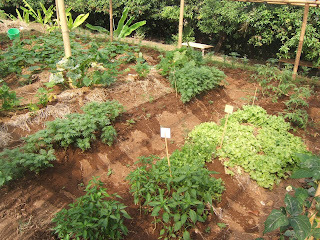 Gede set up the farm, which is situated in Kayuputih Melaka, a ten muinute drive into the hills from Lovina. Pegasus Farm is the perfect place to bring your family and friends. We have horses and treks suitable for everyone -from exciting 2 hour jungle treks for adventurous riders to pony rides for children- no matter what your age or riding experience we guarantee you will have a great time. After your ride feel free to wander around our organic gardens or mango groves or sit down and enjoy delicious refreshments in our sitting area. The farm has been organic for eight years, setting an example to the local villagers. Caring for the planet, the land, the plants, the animals and the humans is what Pegasus farm is about.